BETHPAGE, N.Y., Feb. 3, 2011 -- The Northrop Grumman Corporation (NYSE:NOC) -built E-2D Advanced Hawkeye, the U.S. Navy's newest airborne early warning and command and control aircraft, has landed on the USS Harry S. Truman (CVN 75) and begun carrier suitability testing. With 99 percent of radar testing complete, the purpose of this phase of testing is to assess the aircraft's effectiveness in an operational environment. While onboard the Truman, all aspects of aviation/ship integration will be addressed, including logistics, manpower and interoperability, as well as catapult and arrested landing structural tests. 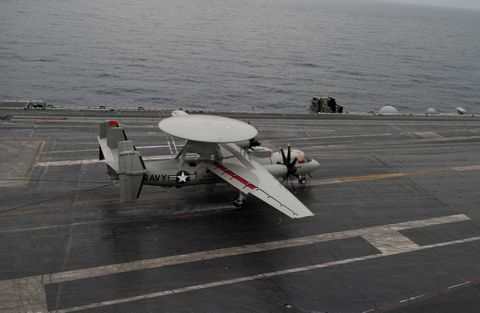 "This first landing of an E-2D Advanced Hawkeye on a carrier deck is a very proud moment for the entire Hawkeye team," said Jim Culmo, vice president, Airborne Early Warning & Battle Management Command and Control Programs, Northrop Grumman. "We're one step closer to delivering this revolutionary weapon system to the warfighter, a milestone the team has been working towards since Delta One took to the skies for the first time in August 2007. As the Navy kicks off its Centennial of Naval Aviation next week, Northrop Grumman continues to be committed to providing this critical first line of defense well into the 21 st century." Led by U.S. Navy Air Test and Evaluation Squadron 20 (VX-20), testing is being conducted by an integrated test team consisting of Northrop Grumman and Navy pilots and maintainers. The aircraft that made the first carrier landing is "Delta One," the first E-2D Advanced Hawkeye to roll off Northrop Grumman's manufacturing line in St. Augustine, Fla. The new aircraft will be able to scan a larger area, detect smaller objects and process information more quickly than its predecessor. The aircrews will be able to accomplish these tasks through improved all-glass cockpits and tactical operator stations. "This new platform features state-of-the-art radar with a two-generation leap in capability and upgraded aircraft systems," said U.S. Navy Capt. Shane Gahagan, Hawkeye, Advanced Hawkeye and Greyhound Program Office. "The E-2D continues the Navy's integrated war fighting legacy by providing broad area coverage resulting in increased range capabilities. With the E-2D's enhanced ability to work in the littoral areas and over land, the platform provides a critical capability to protect our nation's interests."